Time to make First Contact with Alien Civilizations? 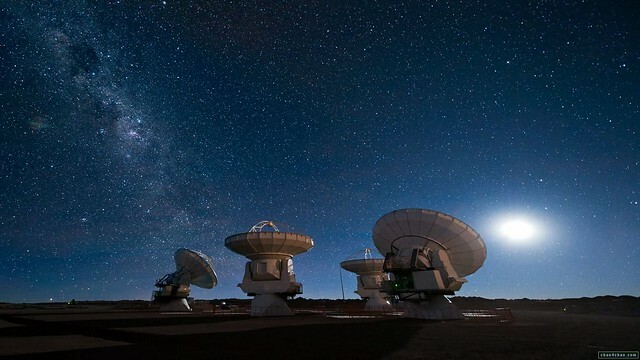 Most every one has heard of SETI — the Search for Extraterrestrial Intelligence — and most also know that, so far, the scientists that operate the powerful telescopes and computers that analyze potential signals from civilizations beyond Earth have come up empty-handed — with the possible exception of the so-called ‘Wow! signal’ (detected only once, for 72 seconds, by Jerry R. Ehman on August 15, 1977). But maybe it’s high time we moved beyond passive attempts at detection of signals from alien intelligences, and move decidedly forward to the next step: active transmission of messages. Scientists at a US conference have said it is time to try actively to contact intelligent life on other worlds. The call was made by SETTI at a meeting of the American Association for the Advancement of Science in San Jose. Dr Seth Shostak, director of SETTI said “Some of us at the institute are interested in ‘active Seti’, not just listening but broadcast something maybe to some nearby stars because maybe there is some chance that if you wake somebody up you’ll get a response. While the SETTI is all for a proactive approach, others argue that making our presence known might be dangerous, like shouting out in a jungle. Sending a message should be considered only after detailed discussion on possible impact, he believes. “The arrogance of shouting into the cosmos without any proper risk assessment defies belief. It is a course that would put our grandchildren at risk,” he said. However, others say we should not fear such a scenario at all – and in fact, failing to make contact could in itself prove to be a huge mistake. Bottom line: Seti dates back to 1960 when a young astronomer called Frank Drake conducted the first microwave radio search for intelligent signals from other solar systems. Since then about 100 searches have been made for radio or laser-transmitted messages from the stars, none of which have confirmed the existence of an extraterrestrial civilisation.